Introduce elegant style and function into your formal dining space with this server. 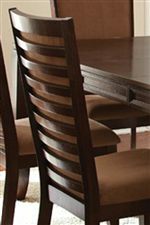 The piece features a dark brown finish and clean lines for a stylish transitional look. Two doors conceal one shelf each, and three drawers offer ample space for serving utensils. Hanging wine glass storage and wine bottle storage ensures easy drink service for dinner parties and gatherings. Modern storage combines with polished style in the beautiful Cornell server. The Cornell Server with 3 Drawers and Wine Bottle Storage by Steve Silver at Walker's Furniture in the Spokane, Kennewick, Tri-Cities, Wenatchee, Coeur D’Alene, Yakima, Walla Walla, Umatilla, Moses Lake area. Product availability may vary. Contact us for the most current availability on this product. The sleek and sophisticated Cornell dining collection features a spacious dining table with an extension leaf and matching upholstered side chairs. The chic, casual style keeps things simple with clean, straight lines and tall ladder backrests for a pleasing contemporary touch. Finished in an all over dark cherry brown with caramel-colored chair upholstery. The Cornell collection is a great option if you are looking for Casual furniture in the Spokane, Kennewick, Tri-Cities, Wenatchee, Coeur D’Alene, Yakima, Walla Walla, Umatilla, Moses Lake area. Browse other items in the Cornell collection from Walker's Furniture in the Spokane, Kennewick, Tri-Cities, Wenatchee, Coeur D’Alene, Yakima, Walla Walla, Umatilla, Moses Lake area.